Do you know someone who spends far too much time on YouTube? 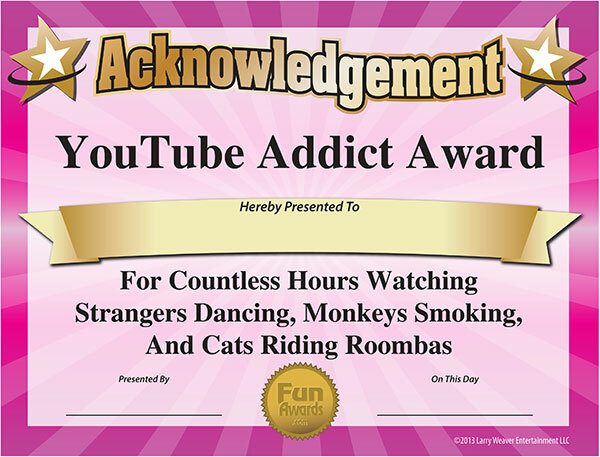 Are they likely to spend countless hours watching videos of strangers dancing, monkeys falling from trees, and cats riding Roombas? Do they constantly forward videos to you, then harass you about whether or not you've watched them? Do they have YouTube hooked up to their television? If you answered yes to any of these questions, your friend may have a clinical addiction to YouTube. 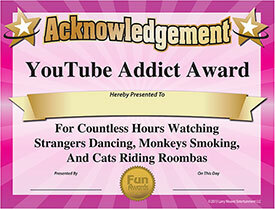 Show them you recognize their video watching excellence with this free funny award. Download the certificate, type in their name, print it out, and post it on their office door or cubicle.